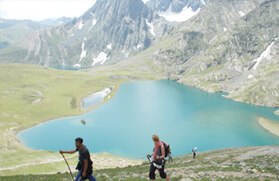 The galvanizing trek in the Kashmir region wheels through the picturesque Sindh valley, along the Sindh River, to the lush green meadows of Sonamarg at an elevation of 2,723 meters. One of the major attractions on this trail is the Thajwas Glacier. From there the trek commences for Nichinai, which is at an elevation of 3,620 meters, cutting across a thick pine forest and en route to Shkoder. The trek from Nichinai continues to Krishansar, at 3,680 meters, which is approximately 15 kilometers from Nichinai and crossing through Nichinai Pass that is perched at a height of 4,084 meters. 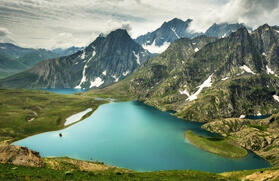 After a steep descent of approximately 400 meters via Gadsar pass, which offers a breathtaking view of the Karakorum Range, the Gangabal Lake Trek leads to Dubta Pani and then whirls to the vicinity of Gangabal Lake, which is at an elevation of 3,575meters. The trek to Gangabal Lake from Dubta Pani whirls through Postpatri before climbing a lofty height of 4,210 meters from where you get a spectacular view of the Karakoram Range. A long twist and downturns brings to a stream crossing, followed by a short climb to the Gangabal Lake and Nandakol. Stir up your energy and head towards Lul Gul pass for a binocular view of Nanga Parbat. Further, to capture the twin lakes in one frame the Zach Pass is the perfect spot. Further, the Vishansar Lake is one of the prime attractions on the Gangabal Lake Trek. You will arrive in Srinagar where our representative will receive you and transfer to the houseboat. After reaching the houseboat, your trek leader will give you some important predeparture briefing. In the afternoon, enjoy a ride in the beautifully decorated Shikara's in the Dal or Nigeen Lake. Overnight stay at the houseboat. 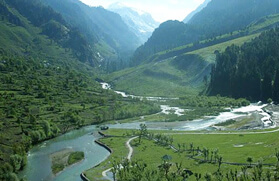 In the morning, drive to Sonamarg, also known as the 'Meadow of Gold'. While driving, get mesmerized by the beautiful Sindh Valley and crystal-clear Sindh River. After the delicious lunch, take a sidewalk to the Thajwas glacier. Overnight stay in tents at Sonamarg. In the morning, we leave the stream to trek towards the Postpatri (Valley of Flowers) to get the fantastic view of the Karakoram Mountains. After reaching the saddle at Mangadub, we begin to trek towards the Zagibal Peak. The climb to the Zagibal Peak is very challenging, but also very rewarding as we get a wonderful chance to see the astounding views of the Gangabal Lakes and Hurmukh Peak. After a short trek, we reach the Gangabal Lakes for a two night camp stay. The day is completely free to have some rest and reenergize your body. During the free time, you can either enjoy a refreshing walk around the lake or rainbow trout fishing. You also have another option to trek up to the Lul Gul Pass and get an astonishing view of the Nanga Parbat Mountain. After the lip-smacking breakfast, we will trek towards the Nunkol and Trunkol villages. We will take some rest in the villages and then start our trek through the dense forest to Naranag. Here, you will see a Buddhist Monastery, where the third world conference of the Buddhists was held. The monastery will also be the finishing point of the Gangabal Lake trek. From here, we will board a chartered coach or a car to reach the houseboat for an overnight stay. You will be transferred to the airport for your onward destination.